The QL series of direct thermal printers has been designed with the most advanced technology in rubberized over-molding to maintain rugged construction and minimal weight. With center-loading media, smart battery monitoring and an optional LCD, they provide user-friendly options to keep your business moving. QL series mobile printers enabled with secure wireless options are easily integrated into your infrastructure. Just a glance at the LCD, and you can read your network settings, or check the communications status. In addition, each printer can be assigned a unique The QL 320 Plus direct thermal mobile printer delivers print widths up to 2.9" (73.6 mm). In addition to offering the rugged construction, user-friendly options, and flexible QuickLink connectivity that have made Zebra's QL 320 and other QL series printers so popular, the enhanced QL 320 Plus printer is specially designed for complex mobile printing applications. 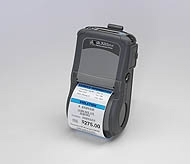 It's built to handle increased levels of wireless security and to process complex labels up to four times faster, making it ideal for the secure transfer of sensitive data such as price lists, customer information, and medical records.